Ok guys, just finished the first art piece for me to contribute. just a crate, every game has to have a crate! Edit: those renders looked fugly! replaced with screenshot, for your viewing pleasure! second edit: both of those looked fugly! here is the new and improved... crate! Ok, getting to work on, from left to right (in case you cant tell ) a crowbar, axe, bat, and machete... will update these soon. Looks like a good start to me. Could you try to render ingame versions of them by importing them into blender and using Lamoot's rendering template? Crowbar, axe and bat look fine for the start. Machete looks unconvincing to my eye. Crates: the one broken down - looks well. - what material is it made of? - what are those yellow squares? Anyway, that seems to be some good starting point. Do you have anything else? That's what I thought. But it's good work, so count me as happy! the belts on the box do have thickness, but dosnt look it from this angle... will fix. the texture is from a piece of plywood outside my house, and the yellow squares are for signs, couldnt think of any, so just left them yellow... will change that as well this evening..
And then you could work them into perfection from that exact angle. I figure these are good enough at that draw distance. and now I have a scene set up for my native modeling programs to make these faster. cheers and I'll continue the work on the weapon displays. BTW: wont be able to work on these till next monday... sorry! I'll put that crate into the game and post a screenshot tonight. It looks better at that size than the first picture. Good work! Its made of parts and pieces so I can make a bunch of these very differently once ive made all of the parts...like legos! Also: For a large item like a building, how big should I render it? big (like this) or in pieces? This a render with the tiles overlayed. The first thing you have to decide is what tiles you are going to use. 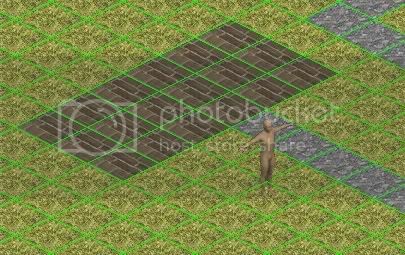 Every tile you overlay that isn't just flat ground we block so that the sprites cannot enter. So you should try and make your buildings confirm a little to this grid, otherwise it will look a little funny. In the picture above, I used the brick blocks as the basis for my house (I basically drew one in the gimp). The rest you can leave to me, since i am trying to automate a method my end to turn your gfx into things the game engine can use easily. So I need a nice simple cropped image with a transparent background. Nothing more, nothing less. These crates look really ok in that perspective. Shanty house: A pipe (over the roof), a barrel and yellow-something-to-the-left don't look like they are metallic. I would also suggest to make the roof dented. It would be interesting to see these things covered with snow as well. ok... I have good news and bad news..
Oh well, I'll get to work on the shanty house again tonight (hopefully) and will post what I've done so far. Maximinus: I already used a template to make sure the building was proper, but your idea is much better! will implement tonight, thanks for the tip!